2 Corinthians 13:11-13 Finally, brothers and sisters, farewell. Put things in order, listen to my appeal, agree with one another, live in peace; and the God of love and peace will be with you. 12Greet one another with a holy kiss. All the saints greet you. 13The grace of the Lord Jesus Christ, the love of God, and the communion of the Holy Spirit be with all of you. Last Sunday’s worship was a doozy. Between the festival of Pentecost and the celebration of Pastor Pederson’s ministry, along with his retirement, it might even be described as epic. It held moments of poignant joy, of laughter through tears – that rare combination of ethos and pathos that sent many of us out on a high that was, dare we say, Pentecostal. Saying a good “Goodbye” blesses the ones leaving and the ones left behind. And we have said goodbye well. But there is more to a farewell than parties, portraits, and parting words. Farewells are work. For starters, there is individual work of figuring out how this new farewell taps and stacks with the other farewells in our pasts. The individual work is important so that we don’t inflict pain from out past goodbye’s to the present moment. Then there is the congregational work of what Pastor Pederson’s retirement reveals about who we are without his leadership. This work is important so that we can offer a good welcome a new pastor. Along the lines of putting things in order, staff just met together and drafted out the church calendar for the next year; Personnel Committee is working toward the selection of an Interim Pastor; Stewardship Committee has made some first steps in teaching and leading us to think about the connection between faith, time, and money; and many other ministries are continuing their work within and outside of the congregation. So, okay, maybe not as invigorating as a good festival but it’s the real stuff of real life where most of us live on most days. Which brings us so nicely into the verses in Matthew where Jesus says to, “Go therefore and make disciples of all nations, baptizing them in the name of the Father and of the Son and of the Holy Spirit.” As 21st century Christians, 21st century Jesus-people, the disciples’ commissioning can seem too big. There’s too much certainty in it. There’s too much history between those words and our world today. These verses in Matthew have a sordid past. People often talk to me about the 13th century Crusades, the 16th century Spanish Inquisition, or the 20th century Native American boarding schools when they’re telling me why Christianity doesn’t work for them. These atrocities wrought by the church in the world can turn us into ‘either/or’ people pretty quickly. Either we reject the whole of Christianity outright deciding that we want no part of whatever leads to the Crusades. Or we believe a life of faith looks like inspiring, festival joy without considering what the death of God in a body on a cross might mean in our lives. Either end of this spectrum doesn’t quite get at anything. People of all religious and non-religious types do all kinds of things good, bad, and ugly. Christians might call the good things people do in terms of being “created in the image of God”; and Christians might call the bad and the ugly things that people do “sin.” Neither the violence of forced conversions nor the 24/7 rejoicing gives us a footing to understand Jesus’ commissioning of disciples – then OR now. The problem is that little word “understanding.” This little word that can suddenly turn us into a group of people who think WE are the good news rather than a group of people brought together by a desperate hunger to feast on the good news. 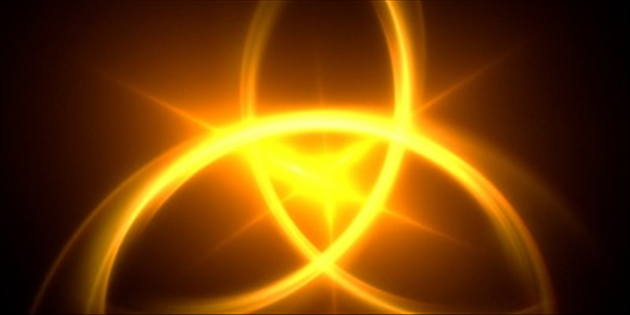 Holy Trinity Sunday adds an extra dash of trouble because it ups the ante on understanding. Suddenly we’re all trying to understand metaphor to understand Trinity rather than be claimed and secured by the good news of Jesus Christ. Along this line, one of my new favorite voices is 20th century preacher Lesslie Newbigin. He compiled and edited a lecture series called The Gospel in a Pluralist Society. The gist of one lecture is that Western Christians are often so concerned about avoiding the label of arrogance that we become either apathetic and never talk about our faith or overly anxious about proving whatever it is we think is true about our faith. Once again, acting out of the assumption that we ourselves are the good news. Jesus is leaving. These words are his farewell. Along the lines of a good farewell, Jesus reminds the disciples and us about putting things in good order. And this order begins with the Father, Son, and Holy Spirit – not with us. Not with us who worship, nor with us who doubt, but with God. It is an action of God, the triune God – of God the Father who is ceaselessly at work in all creation and in the hearts and minds of all human beings whether they acknowledge him or not, graciously guiding history toward it’s true end; of God the Son who has become part of this created history in the incarnation; and of God the Holy Spirit who is given as a foretaste of the end to empower and teach the Church and to convict the world of sin and righteousness and judgment. Before we think about our role, the role of our words and deeds in mission, we need to have firmly in the center of our thinking this action of God. Lesslie Newbigin. The Gospel in a Pluralist Society (Grand Rapids: Wm B Eerdmans Publishing Co., 1989), 243.